Intel’s X299 platform and accompanying Core X-Series processors blur the line between high-end desktops and workstations. They make the incredible power and copious bandwidth available with server-grade Xeons accessible to a much broader audience, from businesses and power users to prosumers and PC enthusiasts. 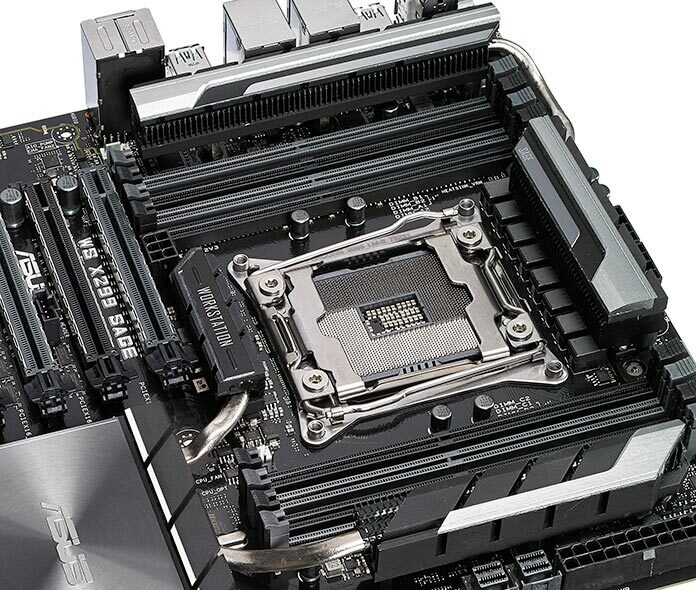 We’ve already introduced a diverse collection of X299 motherboards aimed at desktops, and now it’s time for their workstation siblings to debut. 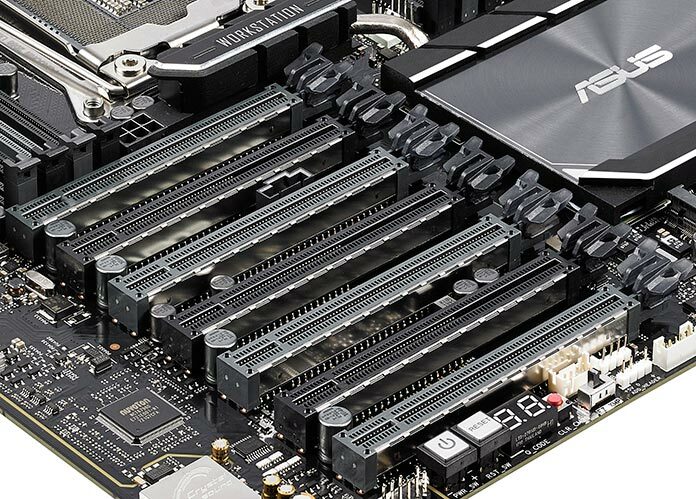 Our new trio of WS X299 boards blends the performance and tuning options you’d expect from ASUS with the extra validation and management functions required by enterprise. 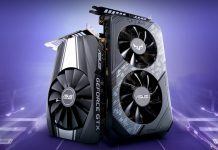 The WS X299 SAGE leads the family with support for four-way graphics configurations, allowing you to apply tremendous GPU power to compute-intensive workloads like deep learning and complex rendering. It’s joined by the WS X299 PRO, which scales back the expansion slots and beefs up the M.2 cooling to strike a better balance for businesses and content creators, and the WS X299 PRO/SE, which adds out-of-band remote management via dedicated hardware. Together, these boards bridge the gap between our desktop motherboards and more exclusive Xeon hardware. 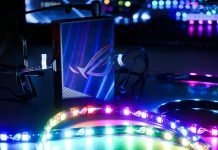 Although the ASUS WS X299 lineup inherits many cutting-edge features from its desktop counterparts, workstations have stiffer requirements. Our WS boards are subjected to more stringent testing than standard models; they meet tighter tolerances in crucial areas like power delivery to PCIe devices, and they endure longer simulated aging tests with extra electrical and environmental variables. We also validate compatibility with an extensive collection of desktop and workstation hardware, including graphics cards, memory, storage devices, and even power supplies. Builders can rest assured that their rigs will be rock solid. 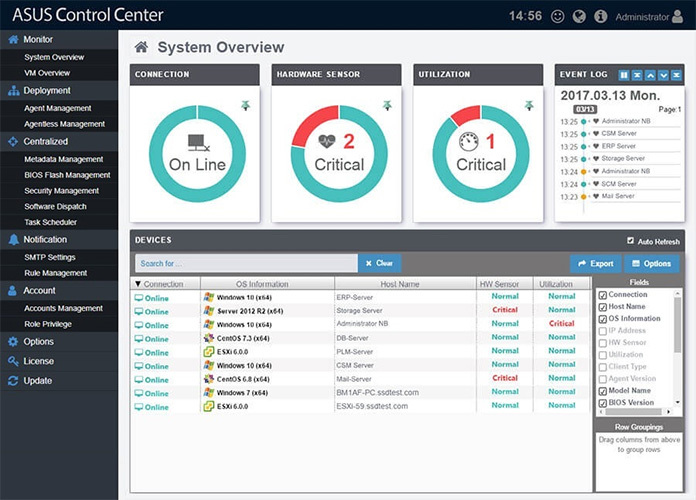 Machines need to be maintained after deployment, which ASUS Control Center (ACC) simplifies with a scalable HTML5 dashboard that’s intuitive to use with PCs and mobile devices alike. It puts hardware and software monitoring at your fingertips along with a full suite of useful functions, like the ability to update firmware and distribute software remotely. You can schedule tasks, edit asset tags, and even keep tabs on virtual machines from afar. One IT management tool to rule them all, ACC can be used to oversee not only the WS X299 SAGE and PRO/SE, but also servers, notebooks, and other compatible ASUS machines. 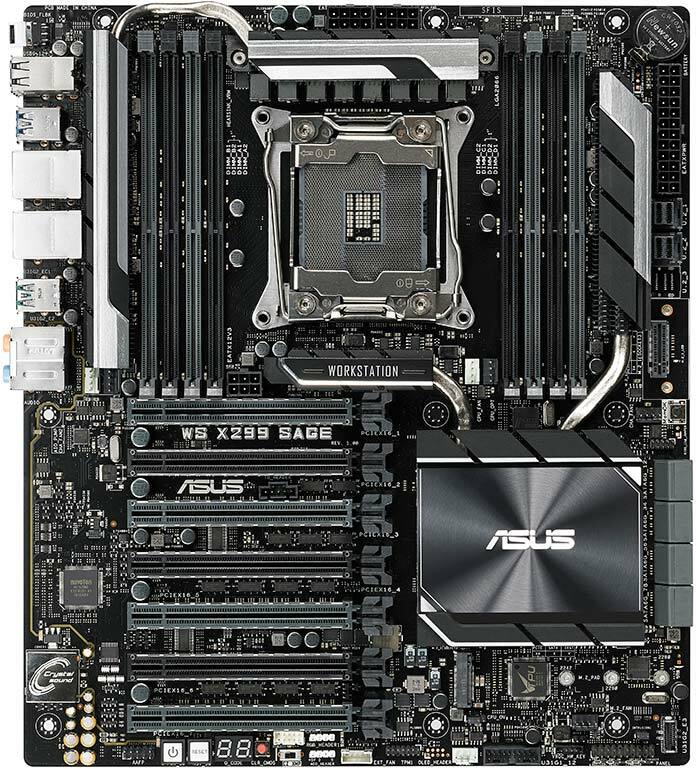 Extracting the best performance from the X299 platform requires careful optimization. With up to 18 individual CPU cores, Intel’s latest Skylake-X chips put significant strain on the motherboard’s power circuitry, so we beefed up the VRM cooling with finned heatsinks and additional surface area. 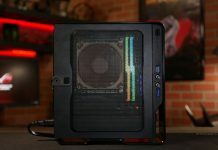 The boards also ship with an optional fan and bracket that keep the VRMs cool enough to avoid throttling while supplying a staggering 460W to the CPU—nearly three times the TDP of the top-of-the-line Core i9-7980XE. 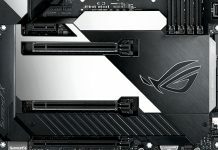 And they’re equipped with a total of three auxiliary 12V power connectors to supply extra juice from the PSU—two dedicated to the CPU, and one for the PCIe slots. The focus on cooling extends well beyond the VRMs. There are six onboard fan headers, two of which are configured by default for liquid pumps and all-in-one coolers. 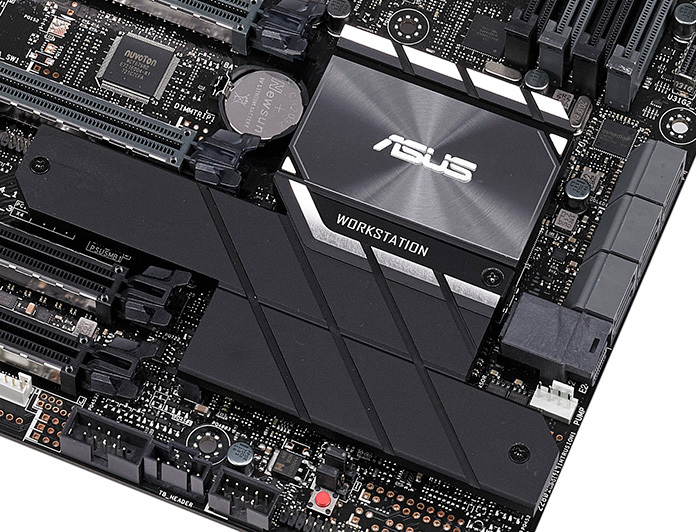 Support for the ASUS Fan Extension Card lets you add three more fans, giving the WS boards enough capacity to cool fully loaded systems. Fan Xpert 4 intelligence manages RPMs based on temperature input from a range of sources, including the CPU and motherboard, a thermal probe plugged into the onboard sensor header, and even the GPU diode on select graphics cards. Each fan can respond to the hottest sensor in a group of inputs, resulting in optimal cooling for a wide range of workloads that stress different components. Robust cooling complements enthusiast-friendly overclocking options that let you reach for higher frequencies to improve performance. Overclocking typically isn’t available on workstation motherboards, but it can improve productivity by reducing the time required for rendering, encoding, and other CPU-intensive work. You don’t have to be an expert tweaker to take advantage, either. With a single click, our 5-Way Optimization software automatically overclocks the processor based on the unique characteristics of your individual chip and cooling. It even calibrates your fans and tunes their response curves accordingly. 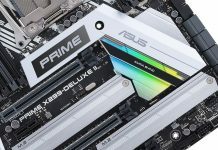 Quad memory channels and support for 128GB of RAM prime the X299 platform for the larger datasets found in the workstation world. Loading up all of a motherboard’s memory slots usually means backing off on the clock speed, but our exclusive T-Topology layout optimizes signaling for when all slots are populated, so you can have your cake and eat it too. With the right DIMMs, our WS X299 boards can hit speeds up to DDR4-4133 across all eight slots. 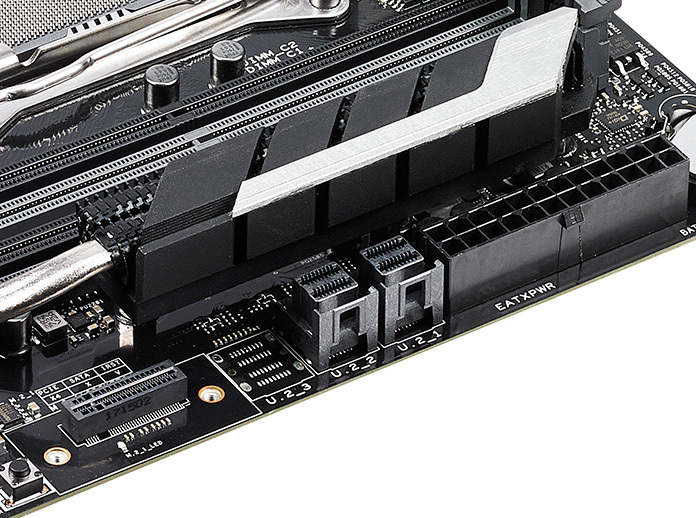 Skylake-X CPUs boast up to 44 lanes of PCI Express 3.0, and the X299 chipset adds more of its own. There’s loads of connectivity for multiple GPUs, NVMe SSDs, and other high-bandwidth devices. To protect your investment, we bolster the x16 slots with metal reinforcements and anchor them to the PCB with additional solder. This SafeSlot treatment helps prevent damage from inadvertent knocks, bumps, and other rough handling that can occur when moving systems or shipping them to customers. New for this generation, Intel VROC technology lets you connect bootable NVMe RAID arrays directly to the CPU using the ASUS Hyper M.2 x16 card. VROC adds to the extensive onboard storage, which includes multiple M.2 slots with Optane support. We also include U.2 ports for cabled PCIe SSDs, plus a plethora of ports for SATA drives. For high-speed external devices, the new WS boards feature 10Gbps USB 3.1 Gen2 ports in Type-A, Type-C, and front-panel flavors. Thunderbolt devices can tap into 40Gbps of bandwidth via our optional ThunderboltEX 3 add-in card. All three boards have dual Intel networking chips with failover support that keeps you connected if one goes offline. 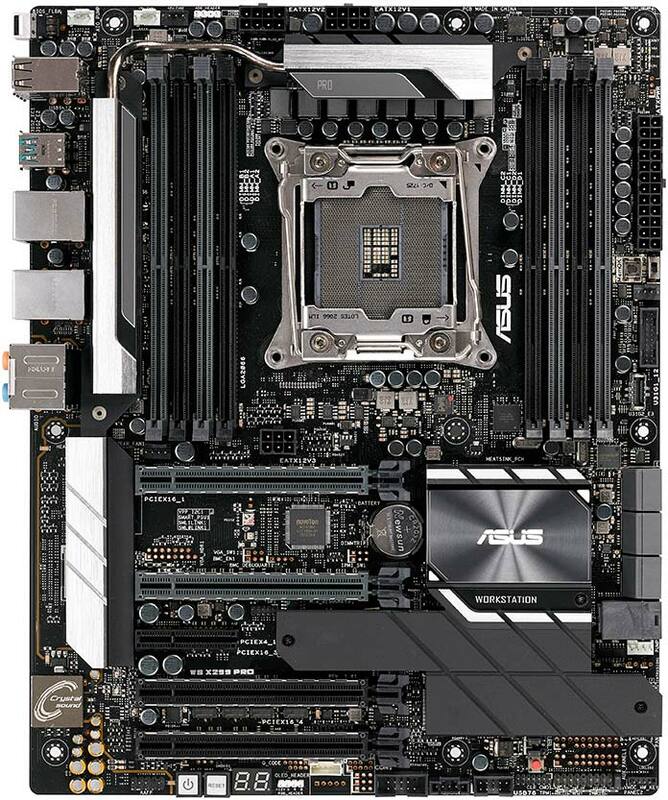 ASUS WS X299 motherboards have upgraded Crystal Sound 3 audio derived from our enthusiast-oriented Prime family. The built-in amplification automatically detects and compensates for different headphone impedances, and DTS Headphone X support delivers a dose of virtual surround sound. We didn’t just focus on pristine output quality; the line input has an impressive 113-dB SNR, which ensures your voice comes through loud and clear when chatting with coworkers or streaming to an audience. While the WS family looks clean-cut and professional, you can tap into its wild side via headers for both standard RGB strips and addressable LED gear. Our Aura software can change the colors of connected devices to reflect the CPU temperature, which adds a functional twist to an otherwise cosmetic feature. And an upcoming version of our Aura SDK will let developers control the lighting with their own software, enabling useful effects bound only by your imagination. With seven full-sized slots and room for up to four double-wide cards, the WS X299 SAGE is made for maximum GPU density. It’s the best board for training neural networks and crunching other scalable compute loads. The slots are connected to the CPU via a PLX switch that not only enables quad-x16 setups, but also ensures that each slot has at least eight lanes of bandwidth when they’re all populated. To dissipate the heat associated with routing so much high-speed traffic, the PLX chip is covered by an intricate heatsink that includes a finned radiator connected via heatpipe. Similar plumbing connects the dual finned radiators that leech heat away from the VRM feeding the CPU. All of the expansion slots support VROC, but if you opt for other add-in cards, there’s still plenty of high-speed storage onboard. Dual M.2 slots are ready for SSDs, and one of them mounts drives vertically near the memory slots, where they can benefit from greater system airflow. The board also has dual U.2 connectors for datacenter-grade drives. Additional real estate is required to house all the SAGE’s hardware, so the board uses a larger CEB form factor that’s wider than standard ATX. It fits into Extended ATX cases but may be a tight squeeze for compact ATX towers. 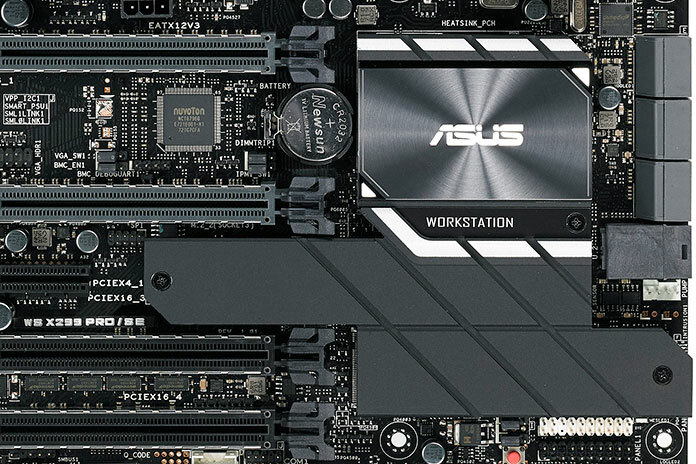 With a standard ATX form factor, the WS X299 PRO fits where larger workstation motherboards cannot. Its appeal extends deeper into the prosumer space, where the platform’s prodigious power can dramatically accelerate content creation. And there’s crossover into enthusiast territory for battlestation builders who want one machine for both work and play. Although it doesn’t match the SAGE, the PRO is still packed with expansion slots and storage interfaces. 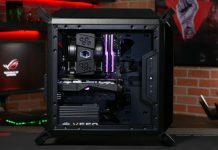 It has room for a trio of double-wide graphics cards, complete with support for three-way CrossFireX and SLI configurations. The mix of VROC support and M.2, U.2, and SATA connectors provides plenty of options for high-speed and high-capacity storage. Both M.2 slots are covered by the chipset heatsink, which helps dissipate thermals to avoid throttling under heavy sustained storage loads. The VRM heatsink snakes around the edges of the PCB, starting with a finned radiator on top of the actual circuitry. Heat is also piped to a secondary heatsink that stretches nearly the full height of the board. The PRO and its siblings are loaded with enough USB for myriad devices, including VR headsets and trackers. We’ve even validated compatibility with the Oculus Rift and HTC Vive as part of our QVL process. The WS X299 PRO/SE largely matches the specs of its namesake but adds extensive remote management capabilities. In addition to supporting ASUS Control Center for in-band communication, it has an ASMB9-iKVM module for out-of-band management. The board can receive keyboard and mouse input remotely while sending a live video feed, all without any client software installed. The ASMB9 module enables remote functions that simply aren’t possible with ACC, like installing operating systems, capturing BSODs, and recording video. It also includes a microSD slot for recording SOL and audit logs. The baseboard management controller supports the IMPI 2.0 standard. Like ACC, it’s capable of monitoring hardware and updating firmware remotely, and access is handled through an HTML5 UI that runs in most browsers. Out-of-band management is better for corporate fleets, but it precludes some of our local tuning options. 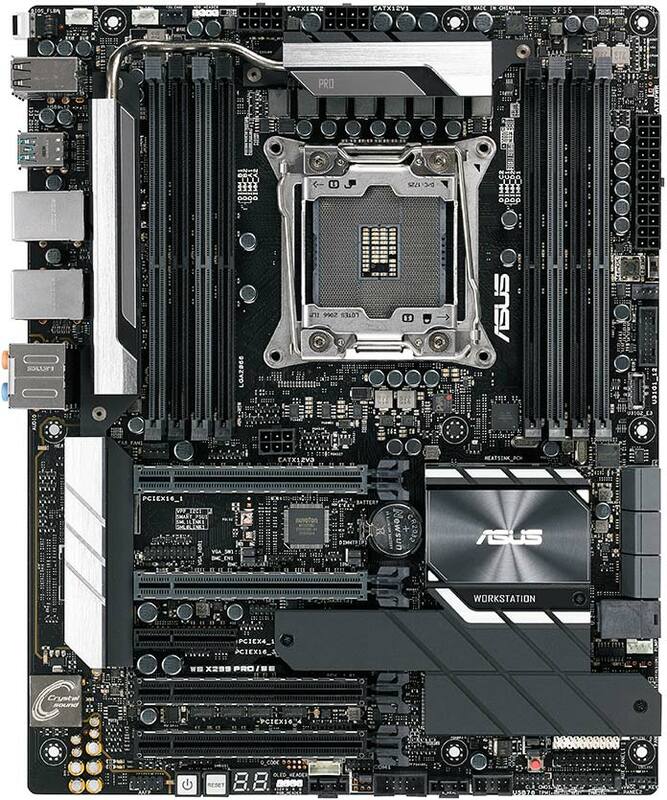 ASMB9 is incompatible with 5-Way Optimization and Fan Xpert 4, which aren’t available on the WS X299 PRO/SE.